That regional identities are constructed is now something of a truism in academic research. More recently regions have been conceptualized in the framework of Frontier and Border Studies, thus emphasizing their relationship to their neighbours in another state across a boundary line. In early modern frontier regions, customs and culture, law and languages, and social and administrative structures very often did not conform to national norms – cross-border ties, and acculturation were of the essence of frontier society. The essays of this volume reassess the role of politics in early modern border societies. Recent historiographical trends, so it is argued, have underplayed this, focusing on cultural exchange and transfer rather than on division and exclusion. The authors investigate whether the focus on communality and reciprocity put forward in recent scholarship has not overshadowed the importance of categories such as the rule of law and administrative and other institutional networks based on political power structures which were distinct on the two sides of the border. Difference was and is a common feature in Europe and its borders. Borders themselves provide normative patterns that regulate interaction both between states and border societies. 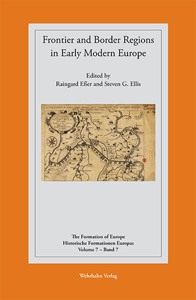 This collection of essays on Frontier and Border Regions in Early Modern Europe addresses a range of problems faced by political authorities in a number of European states c.1500–1800. Instruments of power such as confessional policy, military rule, or the writing of official histories are investigated in their interplay with a regional agenda.